Have been staying at the Sandpiper cottage for almost 30 yrs. It is just a great place to stay, The location along with the cottage itself, which definately gives you that get away feeling rain or shine, weather your napping, reading a book in the hammock on the back deck or just putting together one of your favorite meals in the kitchen. If your looking for cute and cozy this is.Its always clean and tiddy,close to the beach and downtown.And don't forget to check out Pizzafetta some of the best pizza on the Planet! This place is GREAT for anyone who wants to cook, laugh, drink wine, cook, play games, do a puzzle with your friends... They have every cooking utensil needed to prepare any meal you want... the home is lovely and spacious enough to spend days with your homies and not get on each other's nerves... the owners have supplied a great upscale experience in a nice quiet neighborhood and have thought of many nice touches you only find in the best places! The folks who manage the rental property are friendly, responsive, and go above and beyond!! LOVED, loved this place!! This was such a relaxing and beautiful place to stay. It was the perfect combination of cozy and luxury. Definitely one of the most memorable places I've stayed at. 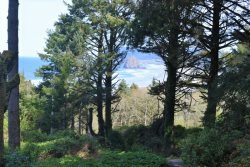 The house is a vacation in it of itself, but accompanied by the sights of Cannon Beach make it a one of a kind experience. Thank you so much! You guys made it perfectly turn-key. Knowledgeable and friendly. Clear directions and instructions so we new where to g and what to expect. The coffee gift was very nice and an unexpected surprise. Thank you. The property is very nice in and outdoors. Furniture and decor is quality and comfortable. Such a beautiful and conveniently located home. We couldn't be happier with our vacation and were so sad to leave. We plan on staying at this home on an annual basis. My sister did all of the arranging. A beautiful, clean home just steps from the beach. Kitchen is well stocked of dishware and utensils. Bedrooms are nicely decorated and bed is comfortable. Would stay again.